Aswath Damodaran, in his excellent paper “Value Investing: Investing for Grown Ups?”, asks whether spending time researching a company’s fundamentals (“active” investing) generates a higher return for investors than a comparable value-based index (“passive” investing)? 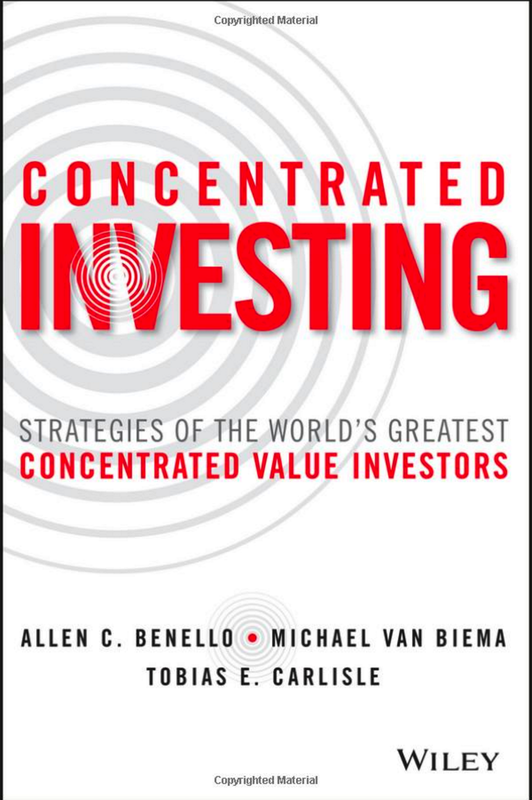 Of all of the investment philosophies, value investing comes with the most impressive research backing from both academica and practitioners. The excess returns earned by stocks that fit value criteria (low multiples of earnings and book value, high dividends) and the success of some high-profile value investors (such as Warren Buffett) draws investors into the active value investing fold. But does spending time researching a company’s fundamentals generate higher returns for investors than a passive index? 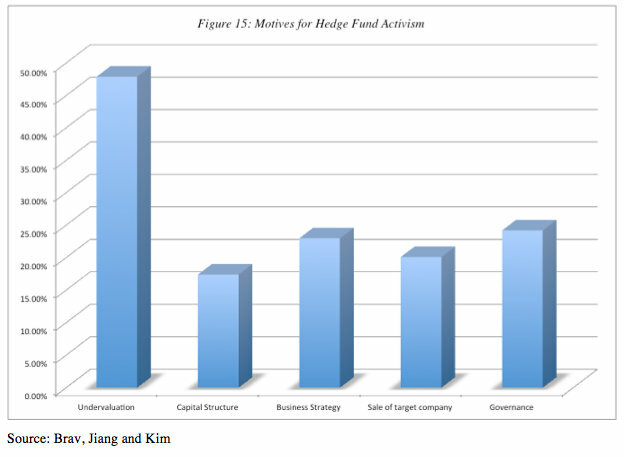 Does active value investing pay off? 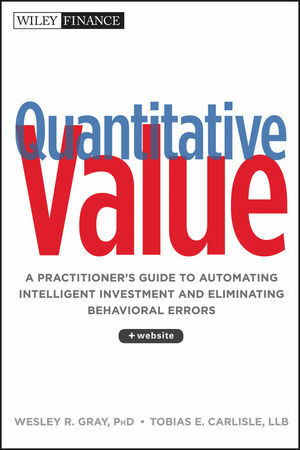 A simple test of the returns to the active component of value investing is to look at the returns earned by active value investors, relative to a passive value investment option, and compare these excess returns with those generated by active growth investors, relative to a passive growth investment alternative. 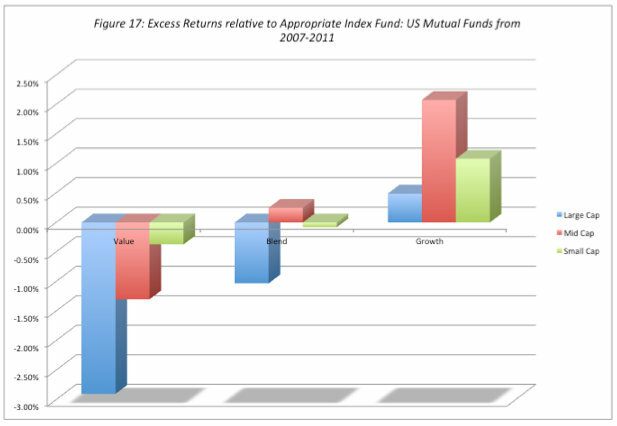 In figure 17, we compute the excess returns generated for all US mutual funds, classifed into value, blend and growth categories, relative to index funds for each category. Thus, the value mutual funds are compared to index fund of just value stocks (low price to book and low price to earnings stocks) and the growth mutual funds to a growth index fund (high price to book and high price earnings stocks). Shocker! 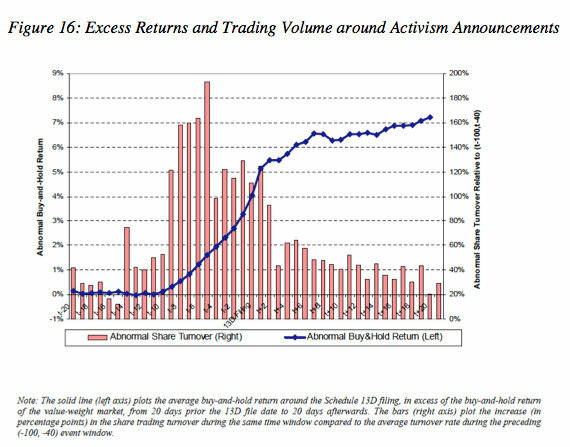 Active value investing mutual fund managers would be better off buying the index. 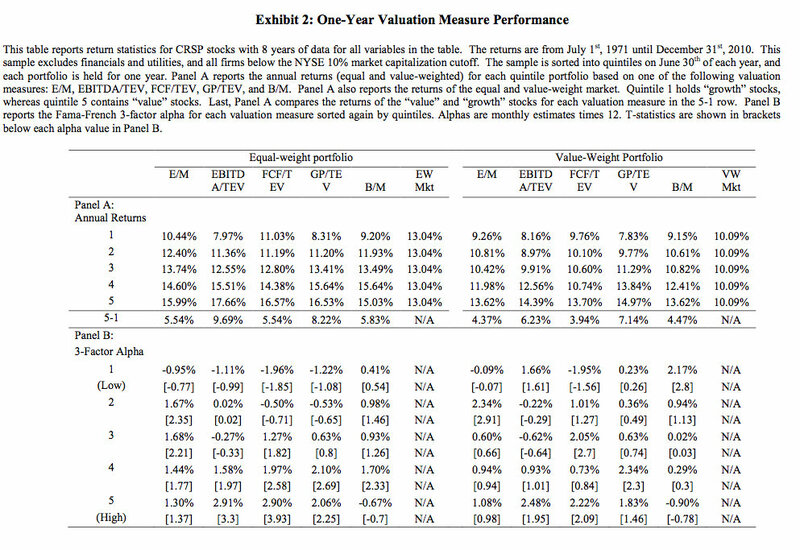 The results are not good for value investing. The only funds that beat their index counterparts are growth funds, and they do so in all three market cap classes. Active value investing funds generally do the worst of any group of funds and particularly so with large market cap companies. If you are an individual value investors, you can attribute this poor performance to the pressures that mutual funds managers operate under, to deliver results quickly, an expectation that may be at odds with classic value investing. That may be the case, but it points to the need for discipline and consistency in value investing and to the very real fact that beating the market is always difficult to do, even for a good value investor. 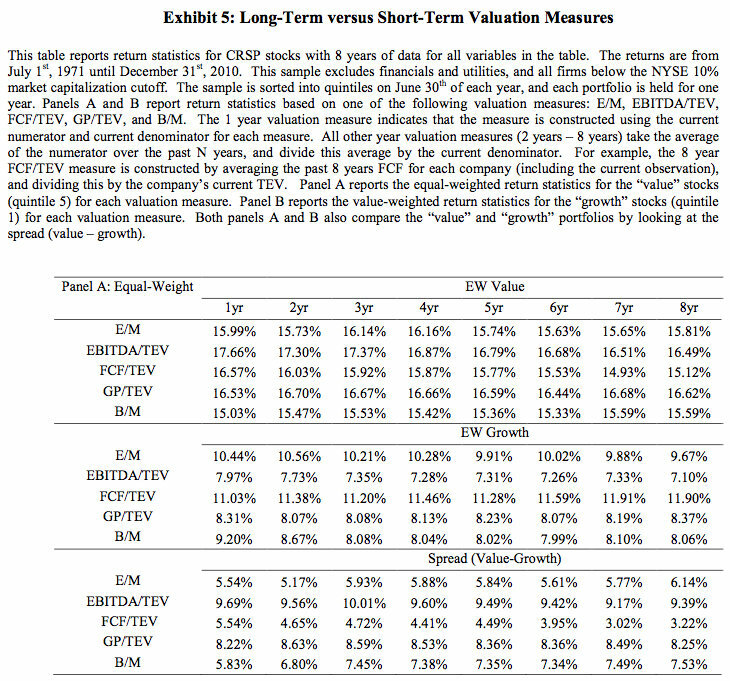 We looked at Damodaran’s passive screeners yesterday, the contrarian value investors are up today, and tomorrow we’ll take a look at the activists. Buying losers seems to work over a long time scale. 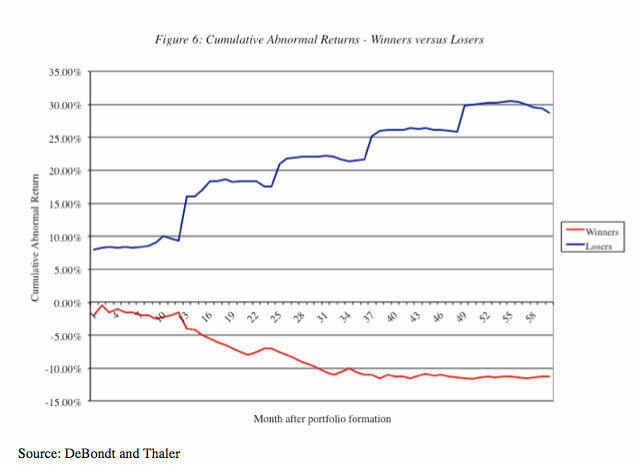 This analysis suggests that an investor who bought the 35 biggest losers over the previous year and held for five years would have generated a cumulative abnormal return of approximately 30% over the market and about 40% relative to an investor who bought the winner portfolio. This evidence is consistent with market overreaction and suggests that a simple strategy of buying stocks that have gone down the most over the last year or years may yield excess returns over the long term. Since the strategy relies entirely on past prices, you could argue that this strategy shares more with charting – consider it a long term contrarian indicator – than it does with value investing. 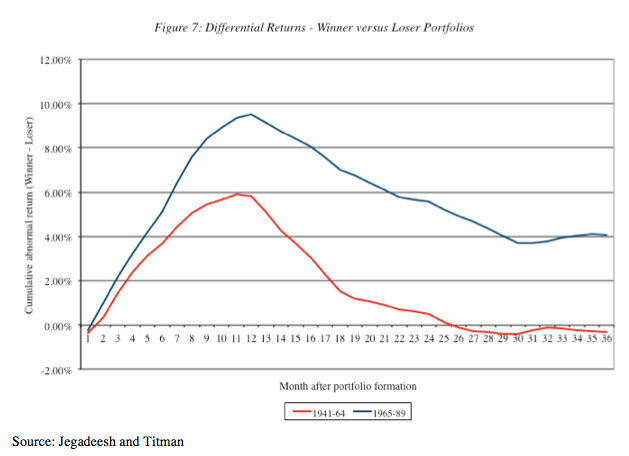 • Studies also seem to find loser portfolios created every December earn significantly higher returns than portfolios created every June. This suggests an interaction between this strategy and tax loss selling by investors. Since stocks that have gone down the most are likely to be sold towards the end of each tax year (which ends in December for most individuals) by investors, their prices may be pushed down by the tax loss selling. [L]oser stocks start gaining ground on winning stocks after 12 months, [but] it took them 28 months in the 1941-64 time period to get ahead of them and the loser portfolio does not start outperforming the winner portfolio even with a 36-month time horizon in the 1965-89 time period. The payoff to buying losing companies may depend heavily on whether you have to capacity to hold these stocks for long time periods. If you are right about markets overreacting to recent events, expectations will be set too high for stocks that have been performing well and too low for stocks that have been doing badly. If you can isolate these companies, you can buy the latter and sell the former. Any investment strategy that is based upon buying well-run, good companies and expecting the growth in earnings in these companies to carry prices higher is dangerous, since it ignores the possibility that the current price of the company already reflects the quality of the management and the firm. If the current price is right (and the market is paying a premium for quality), the biggest danger is that the firm loses its luster over time, and that the premium paid will dissipate. If the market is exaggerating the value of the firm, this strategy can lead to poor returns even if the firm delivers its expected growth. It is only when markets under estimate the value of firm quality that this strategy stands a chance of making excess returns. There is some evidence that well managed companies do not always make good investments. Tom Peters, in his widely read book on excellent companies a few years ago, outlined some of the qualities that he felt separated excellent companies from the rest of the market.23 Without contesting his standards, a study went through the perverse exercise of finding companies that failed on each of the criteria for excellence – a group of unexcellent companies and contrasting them with a group of excellent companies. 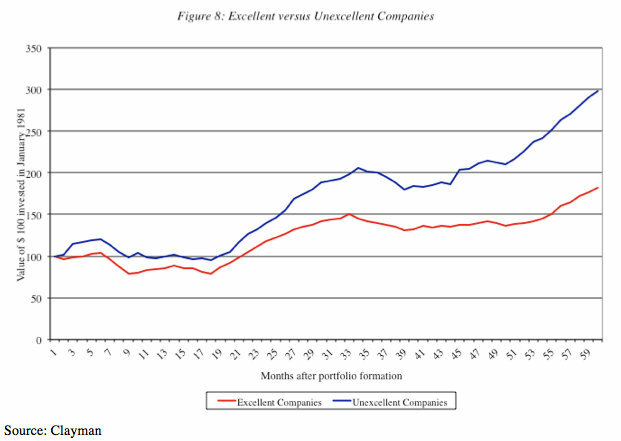 The excellent companies may be in better shape financially but the unexcellent companies would have been much better investments at least over the time period considered (1981-1985). An investment of $ 100 in unexcellent companies in 1981 would have grown to $ 298 by 1986, whereas $ 100 invested in excellent companies would have grown to only $ 182. While this study did not control for risk, it does present some evidence that good companies are not necessarily good investments, whereas bad companies can sometimes be excellent investments. A legitimate criticism of this study is that the time period is very short (5 years) and may be an aberration – it began, after all, right at the end of a tough bear market, where any stock with the fundamentals of the unexcellent companies would have looked like poison. How about a second study? The second study used a more conventional measure of company quality. Standard and Poor’s, the ratings agency, assigns quality ratings to stocks that resemble its bond ratings. Thus, an A rated stock, according to S&P, is a higher quality investment than a B+ rated stock, and the ratings are based upon financial measures (such as profitability ratios and financial leverage). 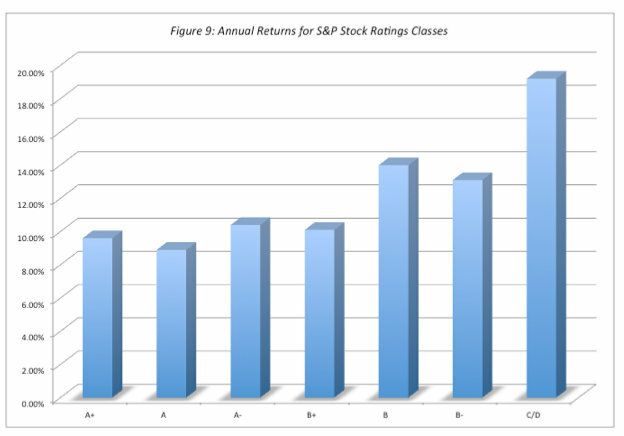 Figure 9 summarizes the returns earned by stocks in different ratings classes, and as with the previous study, the lowest rated stocks had the highest returns and the highest rated stocks had the lowest returns. Looks like a pretty clear inverse relationship between rating and return. Sure, whereof rating, thereof “risk,” but I’m prepared to wear that “risk” for the return. So contrarian value investing works. How do we mess this up? a. 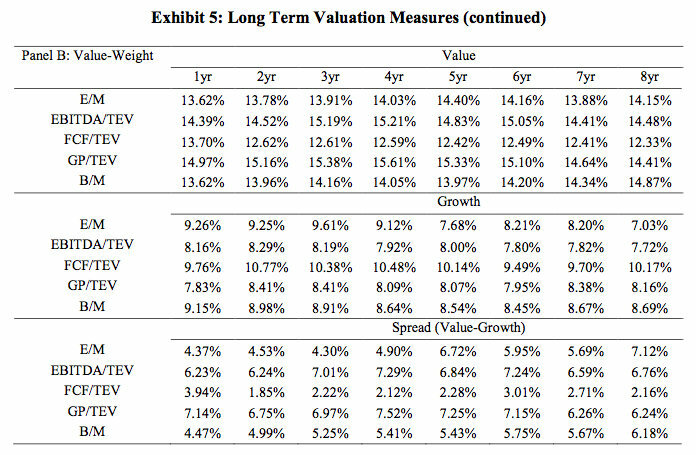 Long Time Horizon: To succeed by buying these companies, you need to have the capacity to hold the stocks for several years. This is necessary not only because these stocks require long time periods to recover, but also to allow you to spread the high transactions costs associated with these strategies over more time. Note that having a long time horizon as a portfolio manager may not suffice if your clients can put pressure on you to liquidate holdings at earlier points. Consequently, you either need clients who think like you do and agree with you, or clients that have made enough money with you in the past that their greed overwhelms any trepidation they might have in your portfolio choices. b. Diversify: Since poor stock price performance is often precipitated or accompanied by operating and financial problems, it is very likely that quite a few of the companies in the loser portfolio will cease to exist. If you are not diversified, your overall returns will be extremely volatile as a result of a few stocks that lose all of their value. Consequently, you will need to spread your bets across a large number of stocks in a large number of sectors. One variation that may accomplish this is to buy the worst performing stock in each sector, rather than the worst performing stocks in the entire market. c. Personal qualities: This strategy is not for investors who are easily swayed or stressed by bad news about their investments or by the views of others (analysts, market watchers and friends). Almost by definition, you will read little that is good about the firms in your portfolio. Instead, there will be bad news about potential default, management turmoil and failed strategies at the companies you own. In fact, there might be long periods after you buy the stock, where the price continues to go down further, as other investors give up. Many investors who embark on this strategy find themselves bailing out of their investments early, unable to hold on to these stocks in the face of the drumbeat of negative information. In other words, you need both the self-confidence to stand your ground as others bail out and a stomach for short-term volatility (especially the downside variety) to succeed with this strategy.